A traditional church for a modern world, proclaiming Jesus Christ, the same yesterday, today and forever. On 28th December 1847, Bishop Augustus Short arrived in Adelaide, bringing plans by the architect Henry Stuckey for Bishop’s Court and a neighbouring church and Rectory. Two days after his arrival, he was installed as the first Bishop of Adelaide in Holy Trinity on North Terrace. 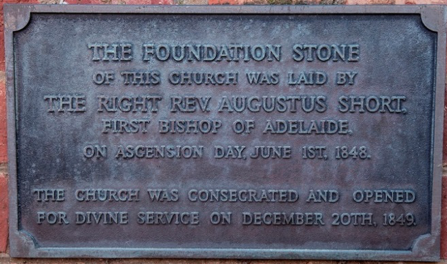 Bishop Short laid the Foundation stone of Christ Church North Adelaide on 1st June 1848, and on 20th December 1849, he consecrated his “neighbouring church” free from debt, adopting it as his Pro-Cathedral having contributed some of his private funds to furnish the Chancel accordingly, with wall ornamentation and stalls for the Dean and Chapter, and his Bishop’s Throne, all of which are greatly treasured by the people of Christ Church. Moving from Kensington to Beaumont to take advantage of the foothills’ lower temperatures, Bishop Short still planned an episcopal residence in North Adelaide, and after morning service in Christ Church, he proceeded to lay the foundation stone of Bishops Court on 9th January 1851 which was a difficult year for South Australia due to the Victorian gold rush. Shops closed, currency was scarce and newspapers reported that “most things in Adelaide came to a standstill…”. In his book “This stone which I have set up”, Archdeacon A L Bulbeck notes that “.none of the clergy abandoned their cures!”. The first incumbent of Christ Church, Canon W J Woodcock had six licenced Lay Readers, and with their help conducted mission services as far away as Two Wells and Virginia, such was the size of the parish during the 1850’s and 1860’s. The first Ordination was held in Christ Church Pro-Cathedral on Thursday 7th June 1860, when Bishop Short ordained The Rev’d Richardson Reid to the Priesthood. Eleven more ordinations were held there, between 1864 and 1875 during which time Bishop Short ordained 23 priests and deacons. Christ Church continued as the Pro-Cathedral of the Diocese for some 28 years, until regular services began in the Cathedral Church of St Peter in May 1877. Over the years, a number of organisations have made Christ Church their “Home”. For many years the motorcycle division of the St John Ambulance Brigade held the annual church service. The Order of St John of Jerusalem, Knights Hospitaller-SA Priory has Christ Church as its Conventual Church and as such, hosts the annual Evensong and the Annual service of Investiture and Thanksgiving for the Priory of South Australia. (The refurbishment of the Chancel in 2011 reflected the importance of the connection with the Order, with the Tester bearing the Cross of eight points, also known as the Cross of The Beatitudes). The Royal Australian Navy holds its Annual Commemorative Service in Christ Church and will install its White Ensign in 2018 on permanent display. The Anglican Charities hold annual services in Christ Church, and a number of private schools greatly value the reverence and acoustics for their annual Christmas carol services. The Oak eagle lectern which proudly stands in the Chancel was purchased in 1878 with the proceeds from recitals given by the organist, Mr Landergan. Following this example, the current Musical Director Mr Andrew Georg has given a number of organ recitals, proceeds from which go toward the David Gallasch Memorial Music Trust, set up in 2012 in recognition of David’s outstanding contribution to the musical life of Christ Church over 45 years. Christ Church has become recognised as a centre of musical excellence, thanks to Andrew Georg together with a professional mixed-voice choir which sings each Sunday at the 10am Choral Eucharist and 6pm Choral Evensong services, drawing on a wide-ranging repertoire spanning the rich tradition of church music. This music excellence is greatly enhanced by the magnificent organ, having its origin in an 1873 12-stop Gern organ, enlarged by Melbourne firm Fincham and Hobday in 1855, and with further work carried out in 1899, 1951, 1970s,’80s, and 90s, and a major rebuild in 2003 carried out jointly by Australian Pipe Organs Pty Ltd and prominent Adelaide company, George Stephens Organ Builders Pty Ltd. The instrument now contains 43 Speaking stops distributed over 3 manuals and pedals and around 2,300 pipes. The Chi Rho is one of the earliest forms of Christogram, and is used by Christians. It is formed by superimposing the first two (capital) letters Chi and Rho (ΧΡ) of the Greek word "ΧΡΙΣΤΟΣ". Although not technically a Christian cross, the Chi-Rho invokes the crucifixion of Jesus, as well as symbolizing his status as the Christ. The Chi-Rho symbolizes the victory of the Resurrection over death and is an early visual representation of the connection between the Crucifixion of Jesus and his triumphal resurrection, showing the death and resurrection of Christ to be inseparable. Anglicans hold the Book of Common Prayer as the central point of unity within the Anglican Communion. At Christ Church, all the services follow the text and instructions contained in this book. It, therefore, plays an integral part in the celebrations including Baptism, Holy Communion and Worship. Christ Church North Adelaide has adopted the Chi Rho as our church symbol.